An evil spell has been cast on the Queen of Maar, and her Captain of the Guard will do anything to reverse it. Their only hope lies on an island half a world away-a place known in myth as Isola, land of the dead. Gotham Academy creators BRENDEN FLETCHER and KARL KERSCHL reunite with series colorist MSASSYK and letterer ADITYA BIDIKAR for a breathtaking fantasy adventure two decades in the making. Recommended for fans of Studio Ghibli and the work of Hayao Miyazaki. 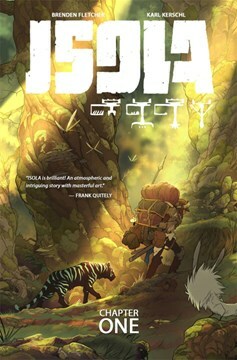 Collects ISOLA #1-5.